This counter clock-wise loop starts with a scenic run through Nicasio Valley followed by a climb up Rocky Hill on Pt Reyes Petaluma Rd. Descend through the gorgeous Hicks Valley for the challenging climb up along the top of the ridge on Wilson Hill Rd to Chileno Valley. Head west through the beautiful pastoral grasslands on Chileno Valley Rd to Tomales Petaluma Rd for a lunch stop in Tomales. Return south on Hwy 1 along Tomales Bay to Pt Reyes Station. Begin this ride from Nicasio town square. Hicks Valley Rd takes you across the open valley, pass the hillside vineyard to the short climb up Hammock Hill. Hicks Valley Rd drops down to the other side of the valley pass a couple of ranches and a lagoon before coming to a T junction. The right turn on Wilson Hill Rd takes you up to the top of the ridge around Antonio Mountain; it’s a steep 7/10th of a mile climb with gradient ranges of 10-12%! Take a look around and enjoy the spectacular valley views! The descent on the other side of Wilson Hill Rd is wickedly fast-it drops down into Chileno Valley. Chileno Valley Rd is a gorgeous quiet country back road with virtually no traffic. The first 3.5 flat miles rolls through the valley floor dotted with grazing cattle and scattered ranches. Continue along Laguna Lake out towards the beautiful expansive pastoral grasslands and meadows. Chileno Valley Rd continues on rolling terrain with magnificent views of the soft rolling hills. Enjoy the picturesque rural country side with its green pastures, grazing cattle and scenic farm houses and ranches. Chileno Valley Rd takes a turn around the hill to the cattle ranch and farmhouse at the NW end of the valley. The road tilts up for a short climb followed by a fast descent out towards the Sonoma County line at Tomales-Petaluma Rd. Head west on Tomales Petaluma Rd for 5.2 miles through the splendid wide open valley meadows and pastoral lands of the expansive Rancho Blucher. The rolling climbs leads to the the shaded stretch of road under the gorgeous eucalyptus stands. Enjoy the sweet spring time scene of the Highland cows and their young calves. Tomales Petaluma Rd comes to a T junction with Hwy 1. Turn right onto Hwy 1 to the town of Tomales. Lunch stop at the Tomales Deli & Cafe. 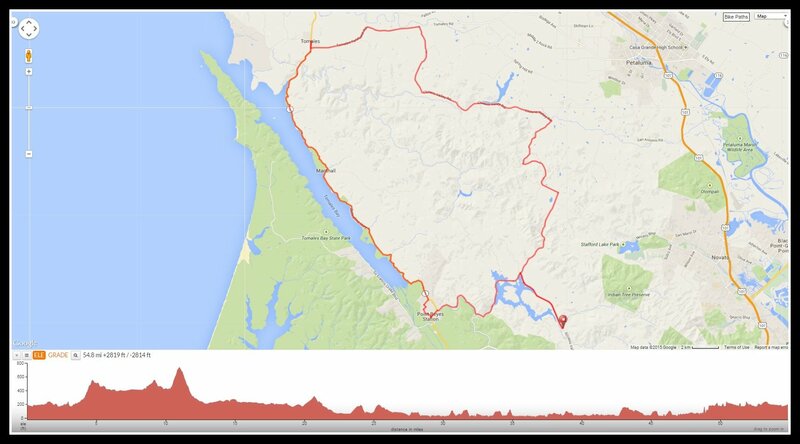 Exit Tomales and take Hwy 1 S; the first few flat miles goes along the lagoon with scenic views of the marshes and surrounding low hills. Hwy 1 S kicks up a bit as you wind up through the grove of eucalyptus trees. The rolling climbs follow the curvatures of the shoreline along Tomales Bay through the small towns of Hamlet and Nicks Cove. The rolling terrain continues along Tomales Bay to the town of Marshall. Stay south on Hwy 1; the rolling terrain continues towards Pt Reyes Station with beautiful views of Tomales Bay. Hwy 1 kicks up for a steep climb from Pt Reyes Vineyards up to the Tomales Bay Trailhead parking lot. Turn right on Mesa Rd; this quiet back road goes around a residential neighborhood at Pt Reyes Station to the center of town. Stop at Pt Reyes Station-Town Commons. Pt Reyes Petaluma Rd continues on flat terrain along the western edge of Nicasio Reservoir to Nicasio Valley Rd. Turn right on Nicasio Valley Rd; the road goes along the reservoir through the gorgeous valley for the small bump up and over to the Nicasio Cheese Factory and Nicasio Valley Farm. Stay on Nicasio Valley Rd for the return to Nicasio town square. This is a fabulous scenic ride around Marin-you’ll enjoy beautiful quiet country back roads through the spectacular valleys and still blue waters of Tomales Bay! Weather: Partly cloudy, cool and breezy with some afternoon sun. Temps ranged from the low 50’s to the mid 60’s with brisk SW winds.